As detailing pros, we all know not to work on vehicles in the sun. UV rays soften up the clear-coat surface on autos and make them susceptible to scratching and swirl marks. Water dries more quickly on the hot surface and leaves chemical and hard-water spots and stains. The vehicle interior even heats up, causing an uncomfortable hand off to the customer. Defined flow paths keep everything predictable. We often use cones and painted lines to define the flow paths, only to have the cones moved or the lines disregarded. A professional shade structure creates a well-defined, easily visible, overhead marker for work areas. Combinations of cantilever structures can eliminate the need for columns in traffic areas and remove potential accident zones, while keeping everyone on the line and the line running smoothly. and exploring ways to speed up our throughput time. If we look closely, we find that time is lost due to employees frequently moving off the line. A careful analysis shows that some of that time is to get into the shade. It may be covered up by extra towel runs or to ask a question, but that extra time off the line exists and is another opportunity to increase productivity. Whether planned or unplanned, time away from the line is time away from the work. 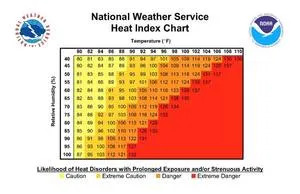 Reviewing the Heat Index Chart contained within the recommended standard (see page 30) reveals that at a heat index of 80° we should have a process in place to protect workers from the dangers of excess heat. 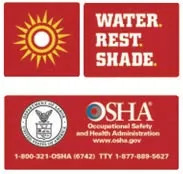 As the heat index rises, we must take even more care to provide for worker safety. WHAT TYPE OF SHADE CAN I USE? Trees provide wonderful shade in parks, playgrounds, and at home. Unfortunately, trees are hard to plant over a detail center. They work well for small team meetings, however, and for off-line rest areas. Metal roofs are a wonderful permanent addition to your building. They provide full coverage in rain or shine (unless the rain falls sideways as it frequently does with the wind). Permanent building additions are the most expensive way to create shade. Solid roofs block all air movement so fans may need to be added to prevent the temperature from rising underneath. Customers benefit along with their vehicles. Walls are frequently added to keep out the sideways rain and fans are typically installed for air movement. Large commercial awnings combine an intricate metal superstructure with a waterproof vinyl fabric laid over the top and laced underneath to the support frame. While not as expensive as metal roofs, they are not inexpensive. With commercial awnings, the challenge lies in the heat conductivity through the material into the space underneath. Heat from the sun beats down on the vinyl cover and is transferred through the material to the underside. The air below is heated up and cannot escape, leading to an increase of the temperature underneath the awning. Fans are usually used to provide air circulation and are somewhat effective depending on the orientation. Maintenance, in case of damage by natural causes or otherwise, should only be performed by qualified service people due to the precise configuration and fit of the structure. No one wants to have a collapsed structure or only an empty steel frame at their place of business. breathes naturally, creating the convection breeze mentioned earlier. Structures use minimal welding and bolting with all components being easily removable and maintainable. Specialists are not needed for initial installation or ongoing maintenance. Shade cloth blocks up to 98 percent of the UV rays, and drops the temperature some 15° below it. The light frame structure allows for all manner of designs. Straight tunnel entry and exits may have standard four-column structures up to 60 feet across. Detail and vacuum areas may have up to 20-foot cantilever designs or 40-foot double-cantilever designs. Entries may have large sails. 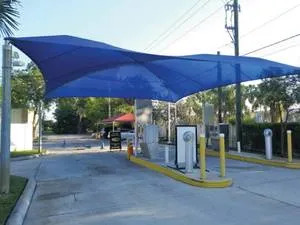 Pay stations may be covered with cantilevered umbrellas up to 16 feet across. Mobile units on wheels can be moved throughout the operation as dynamics change. Even customer waiting areas can have a myriad of shadeport designs. 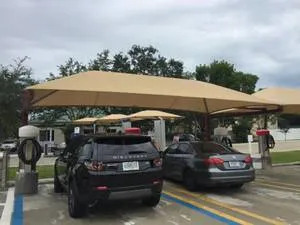 There you have it: From Seattle to South Florida, car wash and detailing professionals all share some similar challenges and have similar solutions at their fingertips. 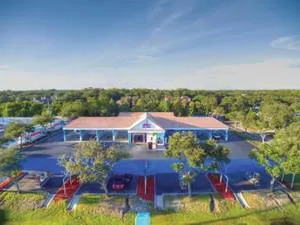 Regardless of where you are located, reach out to a top national shade professional who will spend the time with you and customize a solution to your specific needs. Your business is too important not to! Chip Breitweiser is with Pompano Beach, FL-based Industrial Shadeports. You can visit the company on the web at www.shadeports.com.